Explore the structure and physical features of the Earth, Moon, and Sun with these colorful wall posters. Images gathered from satellite photography are displayed in vivid detail. 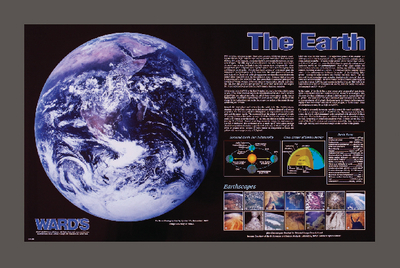 On the Earth Poster, you’ll find information and graphics on the Earth’s motion, seasons, and internal structure. It also comes with a companion reference booklet. Using the clear text and illustrations, the Moon Poster provides some of the physical features and geological history of the Moon. With The Sun poster, students will gain a new appreciation for the Sun’s awesome energy and physical nature. Its internal structure and surface phenomena, as well as key facts about the Sun, are all displayed in a simple, easy-to-understand format.